On Monday night at the end of Tu b’Av I can choose between going to a protest in Mevasseret with Rap, Pop and Mediterranean music or to a protest in Jerusalem with Rabbi Fruman and Ehud Banai. I choose the latter. In the past whenever I’ve participated in a large public gathering in Israel, popular music unites the crowd. I have a theory that popular music at secular political demonstrations takes the place of public prayer for the Orthodox community. So I am excited by the possibility of a popular musician and an Orthodox rabbi together leading a protest event. The hill at the top of Independence Park in central Jerusalem is filled with people of all ages, though mostly twenty and thirty-somethings. Small children do cartwheels. Babies nurse. Dogs with collars lick strangers. The event is organized by the tent camp of single parent families and an NGO called Tikun, whose founder, Dr. Meir Buzaglo, philosophy instructor at the Hebrew University, is the first speaker. What is the meaning of this protest movement, he asks. Is it all just gatherings and marches, slogans and demands? No, he says and proceeds to put the summer of our discontent into a Jewish context. Forty and fifty years ago the state cared for its citizens (well-baby clinics, school nurses, single-parent family subsidies, universal health care, etc.) During the past 20-30 neo-liberal years the government has diminished its role. NGO’s have stepped in where the government used to be. But these NGO’s have their own narrow interests. We live in a jungle of fierce uncontrolled competition. Nobody cares about Klal Yisrael. Is this why we’re here? Is this why we’ve created a Jewish State, to compete with each other? Of course not, the audience responds and Buzaglo continues to explain why we are here in the State of Israel. We are here to return to arvut hadadit: mutual responsibility. If you are not living with self-respect and a roof over your head, then I need to help you. Kol Yisrael arevim ze l’zeh. We are all responsible for each other. (Audience applause). We are here to return to our Jewish values, to implement these values in our poilitical and economic lives. That is the purpose of this protest movement. And guess what? This is a supreme value of the Jewish tradition. There are tractates about this stuff: mutual responsibility in economic and political life. I will not make a profit from your being disadvantaged. To be a witness is a mitzvah. In such a society where people care for each other, tycoons are a problem. This protest movement wants to see the whole picture, not just the cost of housing. It wants to make Judaism relevant in the community, which will lead to a new atmosphere. We will not allow anyone to steal the state from us! (Applause) Before giving up the stage to Fruman and Banai, Buzaglo says this mutual responsibility is not just among Jews. We must learn to love the stranger (ger). I sit and listen to the speaker and the applause and survey the varied crowd and realize I am in the midst of what could become a profound national identity crisis. I experienced this once before–participating in a national identity crisis–but that was in Ann Arbor in 1966. At a teach-in I learned about the military-industrial complex and how it controlled our lives. Now I’m learning about Judaism’s rules for a just society. The two main attractions come to the stage. Rabbi Fruman, 66, wearing a white kitl, a white shtreimel, his face framed by white hair, white peyot and long white beard, sits in a wheel chair, apparently weak from last month’s surgery. His teeth shine white when he smiles, which is often. Ehud Banai, 58, wears dark slacks, a black jacket, black t-shirt and a small black kipa on his dark hair. The scrub on his face is black. He sits and holds a guitar. The day before, Fruman invited his friend Banai, who doesn’t use a cellphone, to appear with him. Fruman talks and Banai plays wonderful songs, the words of which the audience seems to know by heart, except for me and some other Anglo Israelis. All the songs have some starting point from the Bible–David and Saul, City of Refuge, the Golden Calf–but then quickly become personal and relevant commentaries on modern Israel. Banai comments on this summer’s tent phenomenon . Once we were all in tents together, he says. (Exodus) I hope the protest movement will create a new Yavneh, he says (the center of learning that flourished after the destruction of the Second Temple.) Then he sings a song about a path that begins here and leads to a new life. Fruman feels a new spirit has come to Israel and this has happened davka during the three weeks when people study about the baseless hatred that caused the destruction of the Temples. He hopes this spirit will change the face of Israel. He hopes we will learn to love. Then I remember that my earlier national identity crisis was also about love. Make Love Not War said the placards we carried as we picketed the White House. Fruman holds up his left hand and then his right and says both left and right are worthless without each other. Then he claps and laughs and the crowd claps with him. 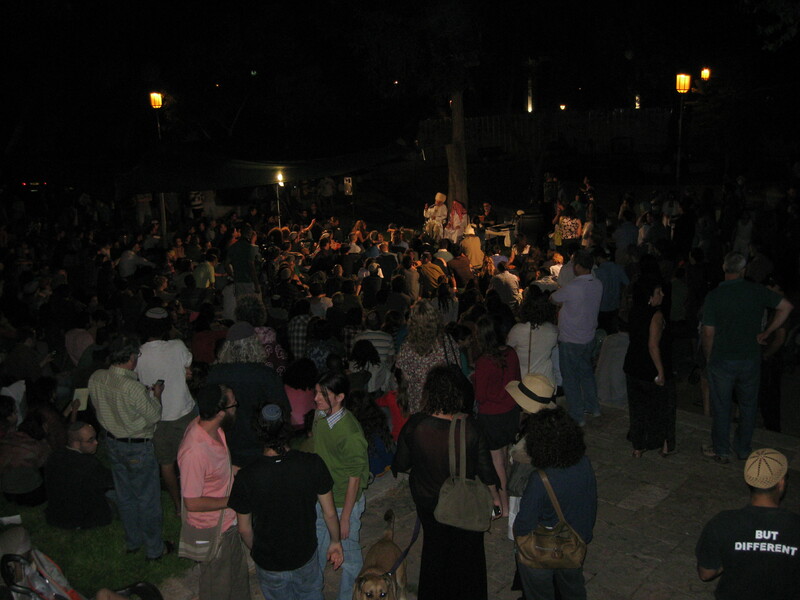 He reads a Reb Nachman story under the full moon in the center of Jerusalem, hundreds of Israelis sitting on the grass listening and hugging. The mood is one of inclusive love, if only from 8-10 PM. Walking away from the crowd (bedtime) I try to overcome my 66 years and squelch my cynicism. Maybe this is the real thing, I dare to think. I want to feel hope. I want to love my fellow Israelis. The feelings struggle to emerge, but they have so many boulders of doubt to surmount. This entry was posted in Israel, Uncategorized and tagged Ehud Banai, New Yavneh, Rabbi Fruman, tent protest. Bookmark the permalink. 1 Response to A New Yavneh? Judy, this description makes me wish I’d been there. It would be nice to believe that love can triumph.